Community activists are furious over a new video that appears to show Brooklyn police roughly detaining a gay man and pepper-spraying him while hurling homophobic slurs at his friends. The video recorded by Maenza and Collins and posted online shows more officers rushing to the scene, crowding the two away from Williams with vulgar threats. 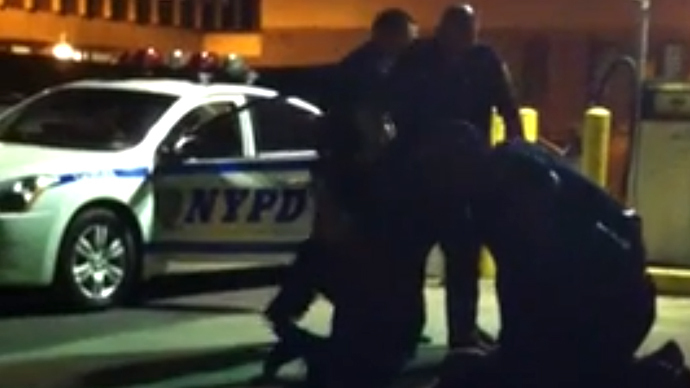 Williams is shown being held against a fence before being thrown to the ground. His friends were also detained after demanding the officers’ badge numbers and telling them the entire assault had been caught on film. “I believe they arrested us because when the last officer who called us faggots, Tony told him that we had the incident on video, and I’m sure he relayed that information inside and they then decided to follow us outside and arrested us,” Collins told the Village Voice. The NYPD informed the Voice that the incident would be subject to an internal investigation, but the excessive force and homophobic taunts have already caught the attention of LGBT groups in the city. Anti-gay hate crimes have increased by 70 per cent so far in 2013, with city officials offering special self-defense classes for anyone who feels they may be at risk. A gay couple was recently assaulted outside Madison Square Garden, raising the number of bias-related crimes up to 24, according to NBC News, ten more than the 14 reported during the same time period in 2012. The New York City Anti-Violence Project announced it will hold a press conference on June 11 at 2:00 pm EST to address both the incident in question and the broader unease.